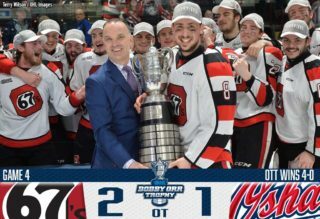 2019 NHL Draft prospect Arthur Kaliyev (8, 9) scored twice and added an assist, netting the overtime winner on a sensational effort to give the Hamilton Bulldogs a 6-5 road win in Oshawa. 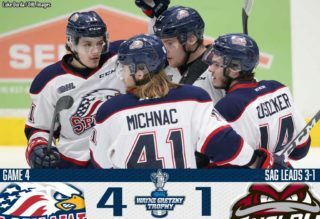 Up 5-1, the Dogs saw their lead evaporate as Oshawa charged back to tie things at five. Kaliyev’s game winner came unassisted with 1:24 left in the extra frame. Brandon Saigeon (5, 6) joined Kaliyev with two goals while Matthew Strome (3) and Kade Landry (1) rounded out the scoring summary for Hamilton. 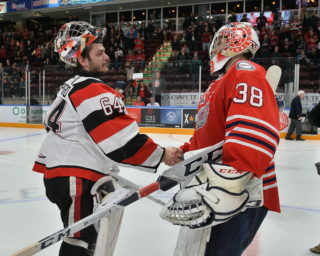 Rookie Zachary Roy made 34 saves to improve to 3-0. 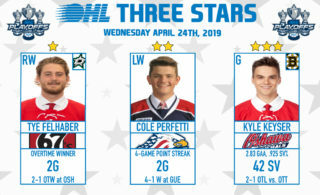 Nando Eggenberger (2, 3) scored twice for Oshawa while other markers came from Nick Wong (2), Nico Gross (1) and Mitchell Brewer (1). The Generals outshot the Bulldogs 39-36as Kyle MacLean and Serron Noel both chipped in with a pair of assists. The Bulldogs wrap up the weekend with a 6-3-1-0 record while Oshawa falls to 3-4-1-0 with a third straight loss.